Check Out The TVAN MK5 – The Off Road Trailer From Outer Space! You don’t have to be a genius to realise that I’m a bit of a nerd when it comes to sci-fi films and fantasy books, so when something that looks as though it’s from another planet lands in our inbox, it’s safe to say that I get a little bit excited. 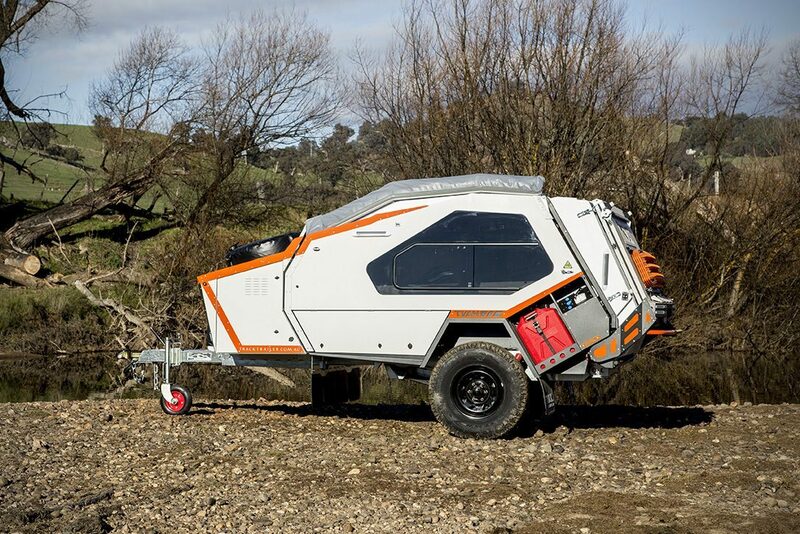 The angular features of the TVAN MK5 give it the look of a futuristic space pod or battle drone, making it the only off road trailer on the market that will get your kids off their computers and out into the big wide world. At 4900mm long in travel mode, the MK5 fits neatly into our small travel trailers category. It’s lightweight and thin enough to make it down tight country roads, and with an axle capacity of 1600kg, you never need to worry about overloading it. These Austrailian owned and made trailers are perfect for everything from off grid living in the outback to impromptu trips to the beach, and are stacked with tonnes of features to make your life on the road easier. TVAN have made some major upgrades to the X-Wing Dream Machine (I’m rolling with that name from now on) from the MK4 model that came before it, all of which are designed to make the off road trailer experience much simpler for the user. Each TVAN trailer comes equipped with an industry-leading off-road hot dipped galvanised chassis that comes with genuine military grade MC2 Suspension®, off-road electric brakes, a rear fold down deck, side panniers…I could go on all day. The model that we’re looking at in this article, The Murranji, also has more cool features than the car from Knight Rider, including an alloy wheel upgrade and cleverly positioned front boot storage. 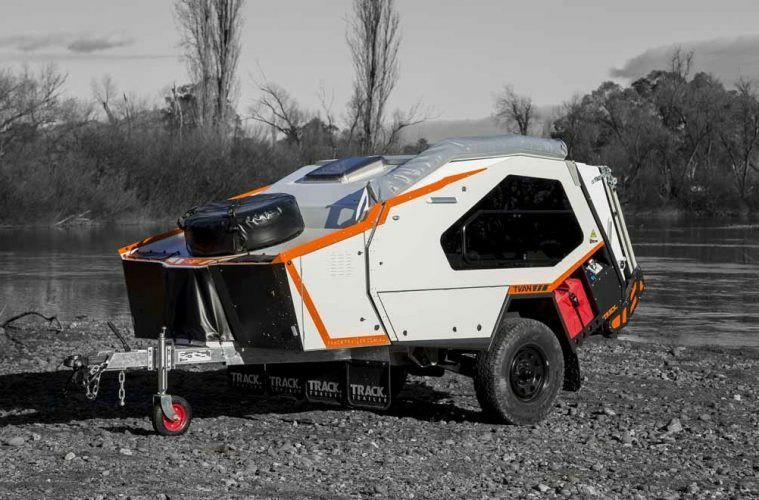 This off road trailer is like Superman’s Swiss Army knife! Is It Good For Living Off The Grid? Absolutely, and with the MC2 suspension as standard you can pretty much tow this off road trailer anywhere that you want! The Murranji comes with a 120W solar panel and two outdoor 240V plugs as standard, making it perfect for outbound living. It also takes advantage of the all-new quick cover awning, which TVAN say can be set up in just two minutes! The front hatch opens up to house a tent that instantly doubles your available space and is held in place by stabilising legs and ground ties. 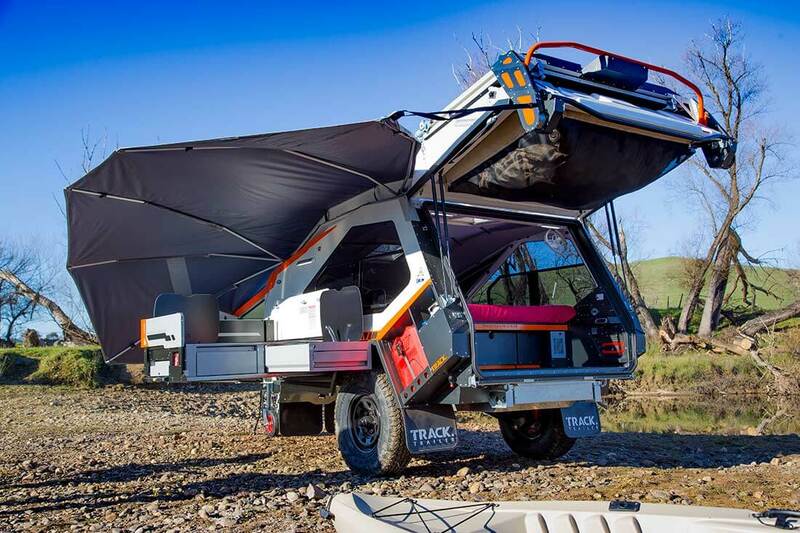 The quick pitch tent design on this off road trailer is revolutionary as far as we’re concerned, but it’s not surprising that TVAN is leading the way for innovative features such as this. They’ve built the X-Wing Dream Machine (it’s catching on) after taking into account 20 years of customer feedback. This isn’t just a trailer that is being thrown at consumers in the hope of them biting; it’s a trailer that’s been influenced by the people who use them day in day out all over Austraila, which means that the features in these machines are the features that the people want and need. 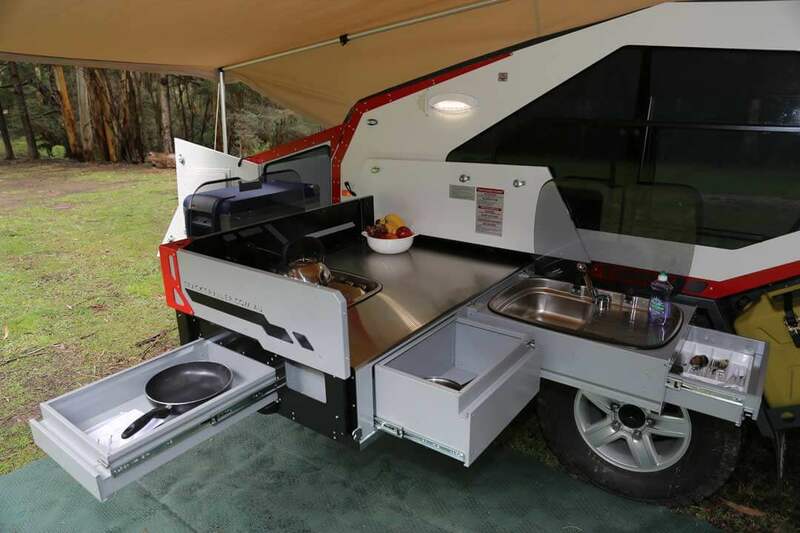 Design choices like the pullout burner and sink being covered by the bat awning are nice additions, letting you cook outdoors no matter what the weather throws at you while keeping the inside of your trailer smoke-free. What’s Inside Of This Off Road Trailer? Lot’s of features in the Murranji are just optional extras on the other TVAN off road trailer models, making it the perfect choice for vandwellers that like to be prepared for any eventuality. 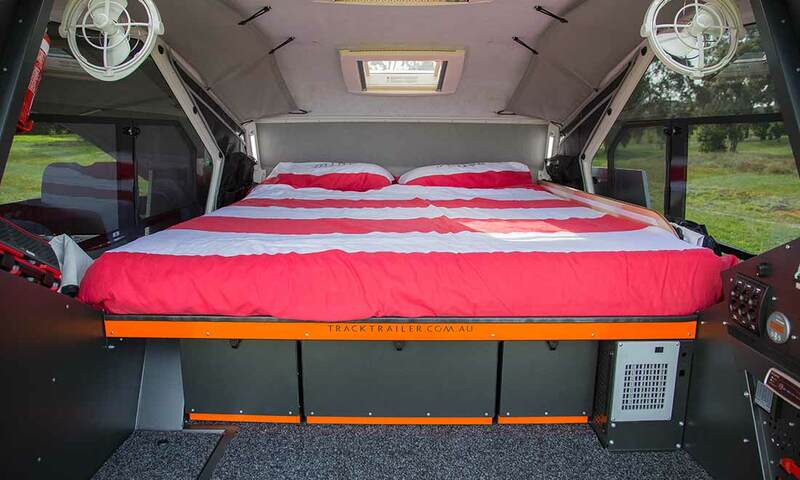 The improved living and sleeping areas have much more headroom than previous models too, which is great for the taller campers amongst us. The tent extension also makes it a family-friendly camping option with tonnes of storage room for all of your off grid gear and van life essentials, as well as a roof storage system and extra pockets in the sidelining. The fabric lined bed head gives you a comfortable backrest if you want to sit up and do some editing or reading while in bed, and the three-speed fan with a timer will help to keep you fresh on those hot summer evenings. The Murranji can also be used all year round thanks to the onboard diesel heater and hot water system. Add that to the portable digital speaker that comes with it, and you suddenly have an off grid living party pad for every day of the year! It wouldn’t be much of an off road trailer if you couldn’t! The Murranji is perfect for the digital nomad on the go, giving you the option to monitor your batteries via Bluetooth with the included display. Two USB sockets can be found on either side of the bed area, and there’s a 300W Pure Sine wave inverter for safe charging of your laptop, camera batteries and other valuable items (TOP TIP – always go Pure Sine to make sure that you don’t damage the batteries in your expensive items). With available space for over 180L of water, 20L of hot water and six jerry cans for liquid storage, the MK5 X-Wing Dream Machine off road trailer could well be the vehicle that they send into space on Elon Musk’s next exploration mission. 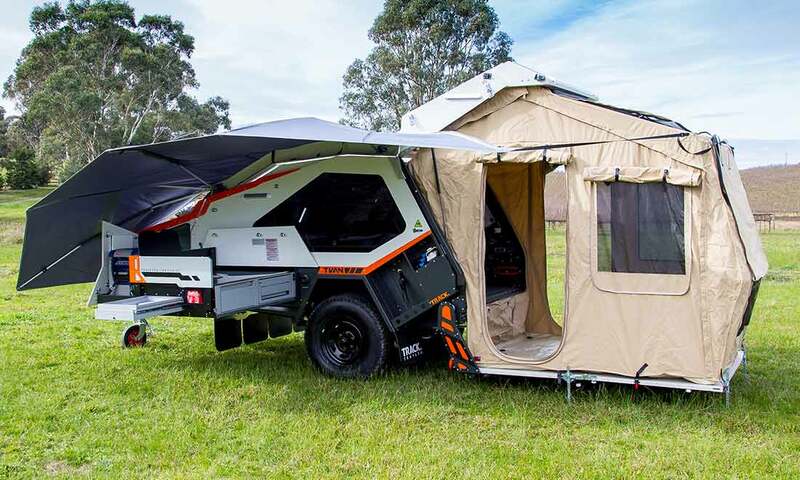 It’s a dinky camper trailer that is fit for any adventure, and with four models including the Murranji to choose from, there’s an affordable option for everyone. If you’re looking for an off grid trailer with attitude that won’t cost the earth in fuel when you’re pulling it around behind you, then the TVAN MK5 should be pretty high up your shopping list. Head to Track Trailer online to read more about this incredible little camper! Looking for more small trailers? Check out the Sherpa Trailer! Christmas is coming. Check out our Campervan Gifts guide for some present inspiration!